In this age of e-vites often languishing in computer inboxes, receiving a printed, personalized snail-mail invite once again stands out. Invitation Twist creates invite impact with a full line of eco-conscious stationary that, once planted and watered post-event, blooms into beautiful flowers. 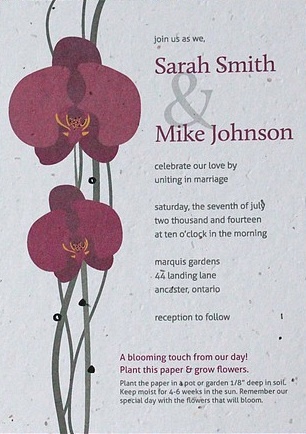 A huge hit with the wedding crowd, handy design templates are workable for corporate and social events, too. Plantable suites include invites, reply and seating cards, envelopes, favour tags, menus and thank you notes. Each piece is produced on quality 95-lb 100% post-consumer recycled white paper embedded with seeds including Black-eyed Susans, daisies, alyssum and more. Need creative assistance? Owner Lori Dale also runs graphics firm Design Twist. In addition to customizing invites, Dale has extensive experience in branding and creating event collaterals, from logos and websites to on-site signage, brochures and training materials.